Getting out and about with my little crew can be tricky at times. 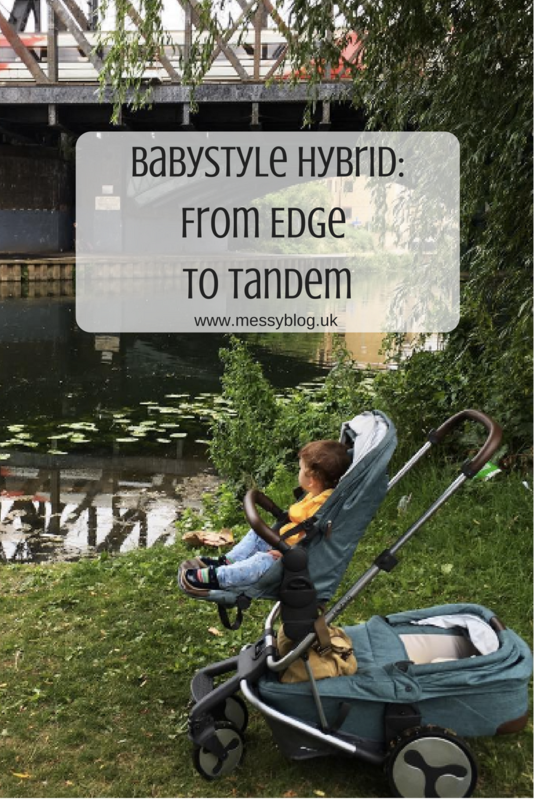 Luckily for us, the Hybrid Edge that we reviewed at the start of the year actually converts to a tandem model, so the birth of Bridget back in June hasn’t meant we’ve needed to go and buy a whole new pushchair or travel system. The Hybrid is pretty simple to convert. I’ve made a very raw, unedited video for you here so you can see just how easy it is. Even Dexter was able to help. Once I’d converted the Hybrid from Edge to Tandem it was easy to spot some vital differences. You instantly lose the basket space. I was originally quite impressed with the space and strength of the basket but now that is completely gone. You can hang bags on the hooks on the handle but then thy hang in the way of the carry cot/second seat. The back of the carry cot comes out further than the back end of the basket used to and as a result, I’ve often kicked it while walking. There is no room for a buggy board. I think in total its 10cm longer and wider. There is only one combination. The seat has to go world facing at at the top. It doesn’t fit underneath the carry cot. On taking it out, you immediately notice the shift in the centre of gravity. It’s heavier to tip up curbs for example and steering isn’t as ‘free’. I can imagine if you had just delivered your baby via a caesarean, this might be quite difficult on your stomach muscles. But with all of that in mind, it does still have some positives. It will still fit in the boot of our ford focus – and thats all three parts, the chassis, the seat and the carry cot. It’s only slightly wider than it was before, so navigating shops is still easy. It looks pretty cool! Many people have commented on how it looks with both parts. It’s quite versatile. 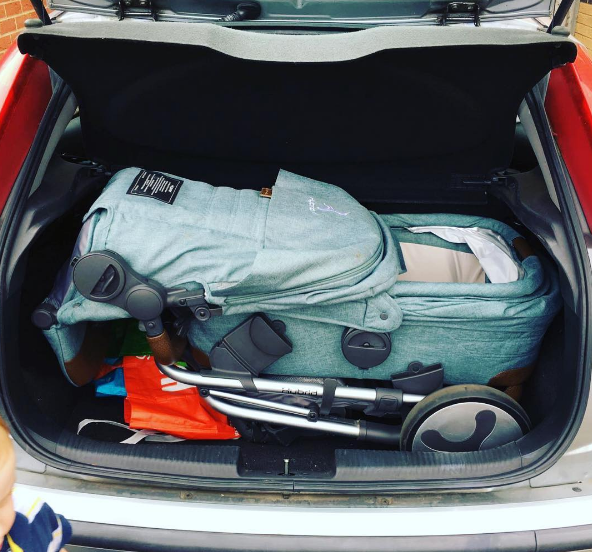 I know I said there is only one combination that works with the seat and carry cot, but you still have a choice of having it with two seats/two carry cots, one of each and you can throw a car seat into the mix too. The hood is wonderfully large and the sun screen that pops out is a brilliant feature. It’s so easy to use, to put together, to recline the seat, adjust the handle etc. It’s intuitive. It’s simple. The colour choices are fantastic. I’ve since had colour regret and really wish I’d chosen the red one. But never mind. The handle is lovely with it’s leatherette detail and is simple to adjust to the right height. Both the seat and the carry cot come with mosquito nets and rain covers as standard. So there you have it. Apart from the lack of bag space, we are really rather quite happy with our Hybrid Tandem. 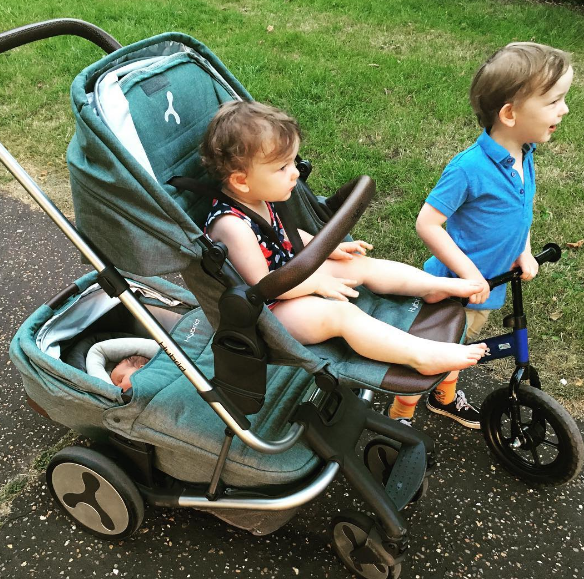 You can find out more about the Hybrid Stroller on the Facebook page and Instagram.